This seal employs standard, modular, inventoried AESSEAL­­® components, with a seal gland, which retains fluid when the screen is emptied. 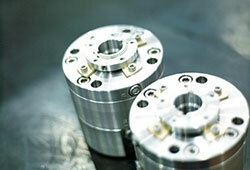 This avoids dry running of the tungsten carbide seal faces on equipment start-up. The LSEAL™ is designed to suit the Flowserve Polychem 'L' Series, Group I and Group II non-metallic process pumps. Mixer, agitator and reactor applications vary from simple blending to solid dissolution to the more exacting standards of suspension, gas dispersion or containing/promoting chemical reactions. The AESSEAL Progressing Cavity Pump mechanical seal (PCPS™) has been developed to incorporate proven modular designs from our highly-acclaimed range of single and double mechanical seals.